When I purchased the silk hankies at the Shepherd’s Harvest show, the seller asked me if I knew how to use them. I wondered to myself, do people often buy things they don’t know how to spin? 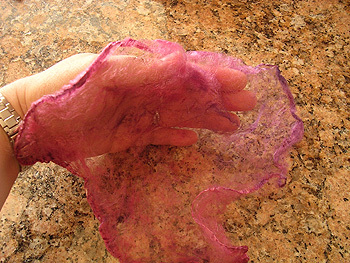 Well, if that’s the case, I thought I’d write up a little picture tutorial for spinning silk hankies. 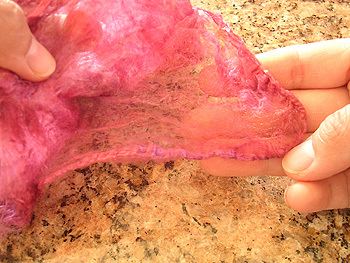 Silk hankies are made by partially degumming the cocoons, opening them up to remove the bug, and spreading the fiber on a square frame. You can read more about the process here. 1. 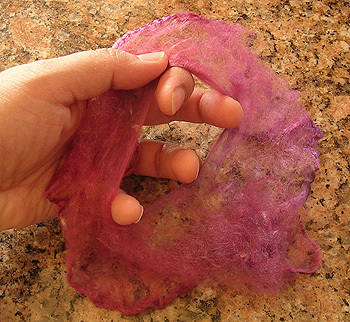 I have 1 dyed hankie draped over my hand – note that it is a very thick layer of cocoons, and you can barely see the outline of my fingers through the fiber. 2. The different layers are obvious at the edges. Grasp one layer and tease it away from the rest of the hankie. 3. Gently peel the layer away. 4. This is a single cocoon. It is transparent. 5. Make a small hole in the center of the hankie. 6. 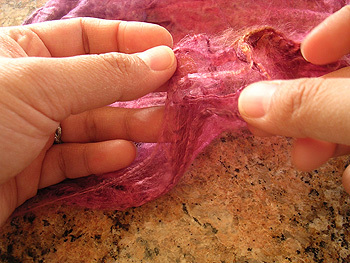 Widen the hole and stretch the hankie into a loop. 7. 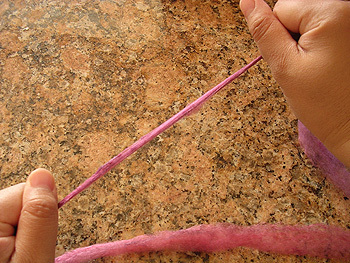 Begin pulling the fiber into a narrower strip and larger circle. The fiber will tear a little. This is normal. Nubs that don’t draft smoothly will show. This too is normal. 8. 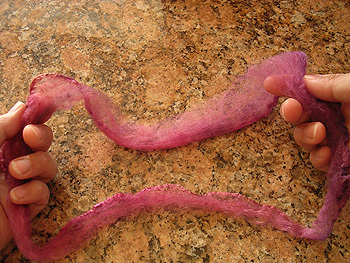 Draft in a continuous circle until the fiber forms a roving that is near or at the width of the desired yarn diameter (ie, no more drafting is needed, only need to add twist to make the final yarn). 9. I keep it in the closed loop stage until I finish drafting. 10. 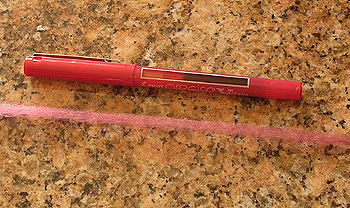 I break the loop (now it’s a long piece of pencil roving) and spin it onto a spindle. And that’s it! Piece of cake! I haven’t timed myself, but I think it takes ~15 minutes to draft and spin 1 hankie. It’s a good break between timed chores (ie, 30 min of cleaning the kitchen, spin 1 hankie, 30 minutes of sorting and paying bills, spin 1 hankie, etc). 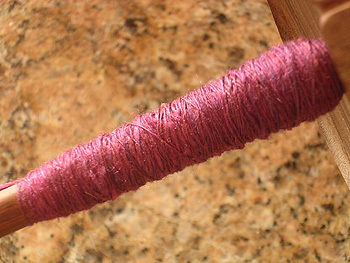 I’ve heard repeatedly that you can’t draft after you’ve begun spinning because the twist locks the fibers in place. I’m not sure if that’s always true. You can still draft – yes, you are breaking fibers, but you’re doing that during the entire drafting of the cocoon, anyway. 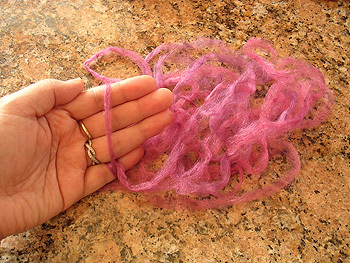 It’s possible that it would be much harder to draft roving that results in a thick single, but I had no difficulty doing a little last-minute thinning of the roving while I was adding twist. Great tutorial, June. Very timely as I’m hoping to pick up some silk hankies at Cummington. That’s very helpful indeed, as I’ve started to experiment with silk cap for the first time. I’ve been trying to decide whether the little nubs that don’t draft are supposed to create a slightly slubby yarn, or whether I’ve done it wrong/not drafted enough. Great tutorial! I’ve always wonderend how you spin those things. I liked your tutorial so much that I posted a link over at whipup. Awesome – thanks for posting! I kep wondering what those were when walking around the MD Sheep and WOol. I may have to pick some up next time. Tremendous – didn’t see any of the cocoons/hankies at the festival. Where did you find yours? I’d love to give this a shot. Thank you for showing that. I’ve always wondered how it was drafted from the square. I’ve got to try adding this to my spinning now. 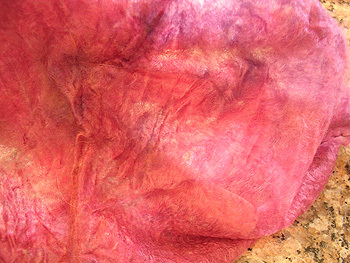 I haven’t a hankie in years, but I remember having lots of fun with it. Someone gifted me some hankies and I was just never able to get an even enough pre draft to be content with the results but your tutorial is making me want to try again. Thank you. Ooh thank you! I bought a hankie at MDSW because it was too pretty to pass up. I figured I’d find a tutorial on line and lo and behold! Do you think it’s safe to spin on a wheel? I’ve never spun a hankie because I hadn’t a clue of how to do it. I think you’ve solved that problem with your clear and to-the-point explanation. Thanks! oooh I think I can do it now! Thanks! THis is great! This looks like a gateway drug to me…. I’ve resisted buying hankies, but no longer! spin a hankie?? I’m using mine for crazy quilting. I have one that’s green/brown/rust that should be great for bushes, grass, trees, background. NICE! I always wondered how to do that. Well, I buy stuff I don’t know how to spin. All the time, actually. Whats more surprising is sometimes I buy stuff I think I know how to spin, but don’t. Or vice versa. Good tutorial! Now i have to locate my silk hankies, and slather on lots of lotion so the silks don’t hang on my skin tears . . .
thanks for the tutorial, i’ve never bought a hankie cause i have ni idea what to do with it. Great photos — I’d add one step, though. I take the beginning end, from which I pulled, and wrap it around the fingers of my left hand (or a wrist distaff) with a half twist, continuing until I’ve made a small ball. The last bit pre-drafted is on the outside. It was great meeting you last Saturday! and seeing your lovely shawls in person. When I spin hankies I like to have a bunch prepared so I don’t need to stop while spinning, so I roll each drafted hankie onto a index card and tuck the ends into a couple of slits on the card. Rolling them on makes sure no twist is introduced into the fiber so, if needed, I can draft them a little more while spinning. Thank you for the wonderful tutorial. I bought some at MS&W last year but haven’t gotten the nerve to spin them yet. The vendor also suggested using baby powder on your hands to work with them. Maybe I will get up the nerve this weekend to try to spin one. Great tutorial. I’m adding it to the resources section of my links page! Great tutorial; good clear pictures depicting the process. I always draft more as I spin. But it sure does go fast once the hankie is circled into roving. I don’t like the nubs that the edges leave. I’ve never figured a good method of getting them smooth as silk. Pingback: Turtlegirl’s Bloggy Thing » It’s So Beautiful I Could Cry! Quick! Get a Hankie! What a great thing to learn – thank you for posting this! Thanks! That’s lovely and good to know. I’m not so wild about the whole “bug” part.